One thing that I love about this recipe is how light it is texturally. Part of this wonderful texture is the addition of 2 extra egg whites. When whipped with the other ingredients, it adds a lightness that transcends as it bakes. After this lovely cheesecake bakes, it's topped with a thin layer of strawberry coulis before chilling for several hours (overnight is best). So when it's time to cut a slice, don't worry if it doesn't exactly hold its shape perfectly like traditional dense cheesecakes do. Just enjoy how it tastes. That's all that matters anyway! Combine the almond flour, 2 tablespoons sugar and butter in a bowl until Press mixture firmly over bottom and 1/2 inch up sides of a 9 inch springform pan. Bake in a 350˚ oven until lightly browned for 10 minutes. Pour cream cheese filling into crust. Return to oven and bake until filling jiggles only slightly in center when pan is gently shaken. (35-45 minutes) Cool in pan or on rack for 30 minutes. Mmmmmmmm......this looks delicious. 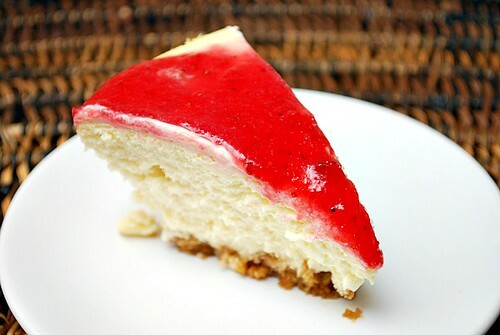 Not always a fan of cheesecake, but this one looks like one to try. Thanks for the recipe. Lovely cheesecake. Bookmark ! Thanks for sharing.